All monthly meetings are held at the Rickhouse - 717 Poplar Avenue - at 11:45 am unless noted below. 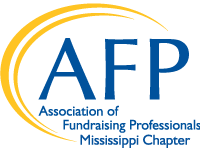 July 11, 2018 - Sammy Moon with the MS Association of Grantmakers will present the latest information on grant opportunities. August 8, 2018 - Christ Blount, Executive Director of the Wilson Research Foundation at Methodist Rehabilitation Center and Amanda Fontaine, Executive Director of the Mississippi Burn Foundation, will present a program on events. September 12, 2018 - Demi Brown, Associate Dean of Intercultural Affairs and Community Life at Millsaps College will speak on the importance of diversity in fundraising. October 10, 2018 - Charles Lindsay, CPA with Matthews, Cutrer, and Lindsay, P.A. will present "Ethics in Fundraising". November 14, 2018 - Charlotte Parks, Vice Chancellor for Development at the University of Mississippi, will make a presentation on capital campaigns.